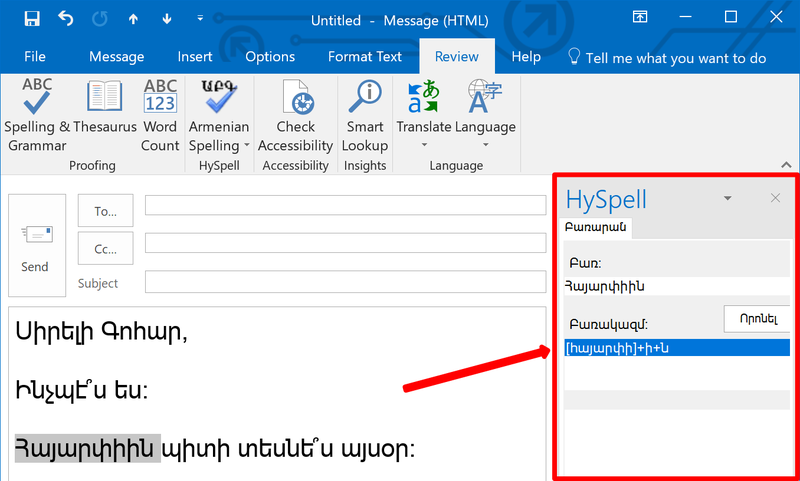 This guide will show you how to configure and use HySpell Armenian Spellchecker for Microsoft Outlook. 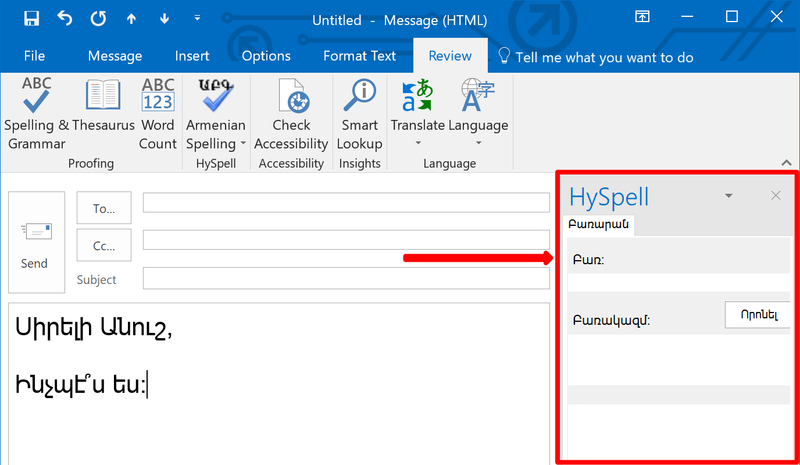 HySpell is a spellchecking plug-in (i.e. 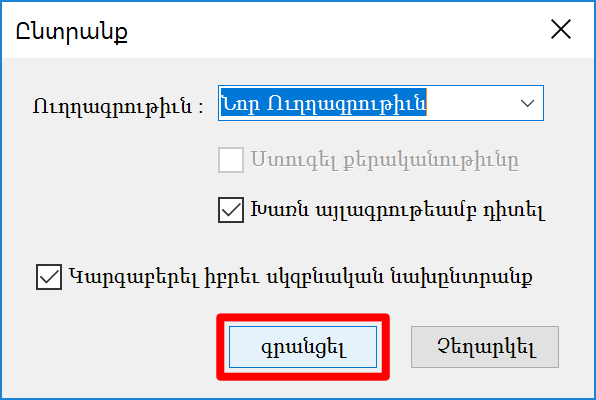 customization) that runs inside Microsoft Word and Microsoft Outlook. 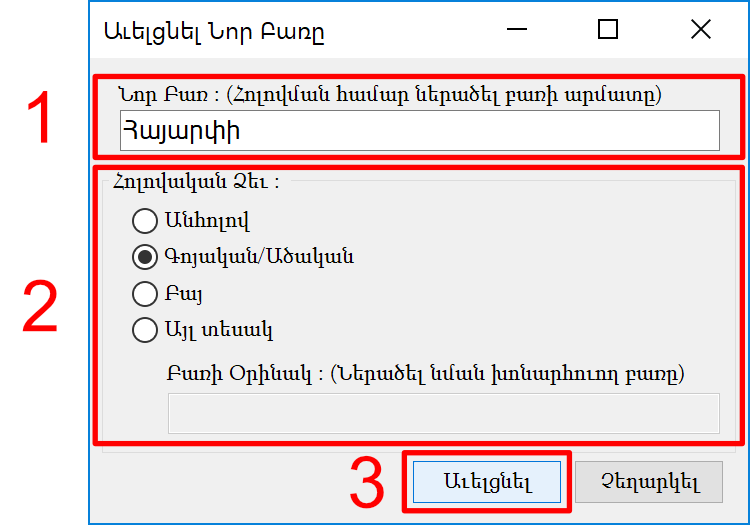 These instructions have been tested on Windows 10 with Microsoft Outlook 2016. 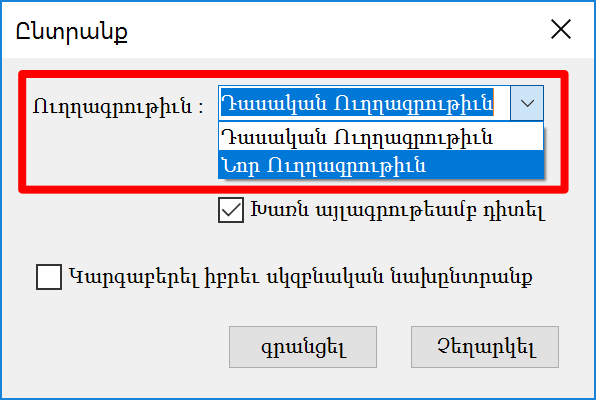 The instructions are similar for other versions of Windows and Microsoft Outlook. 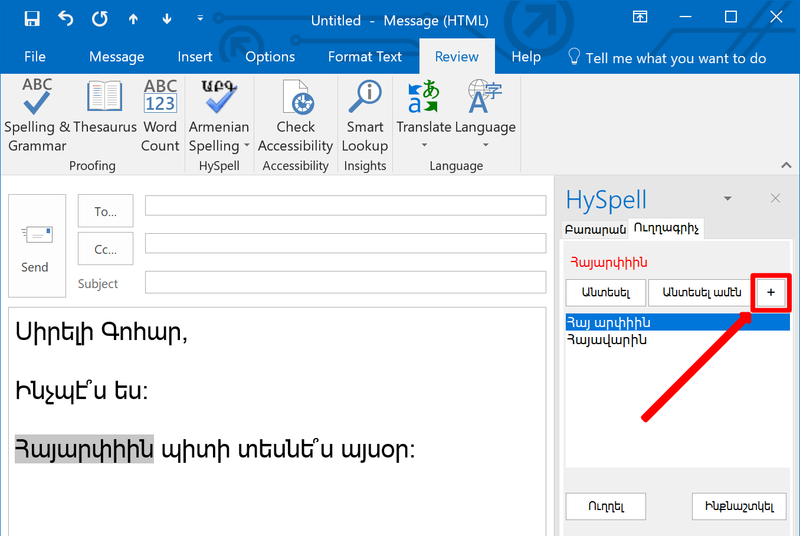 For Microsoft Word, see its corresponding user guide: the HySpell for Microsoft Word User Guide. 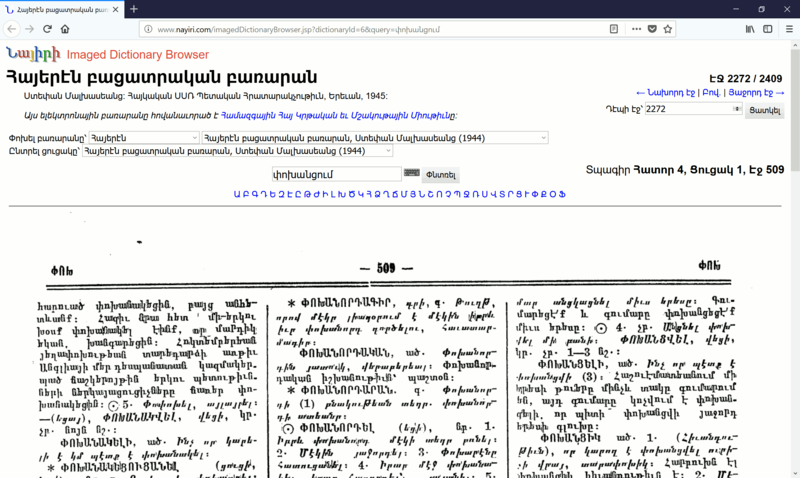 HySpell also supports reformed Armenian orthography (also known as Soviet Armenian orthography) which was the result of spelling reforms in the 1920s in Soviet Armenia; this is the predominant spelling system used today in the Republic of Armenia and the former Soviet Union. 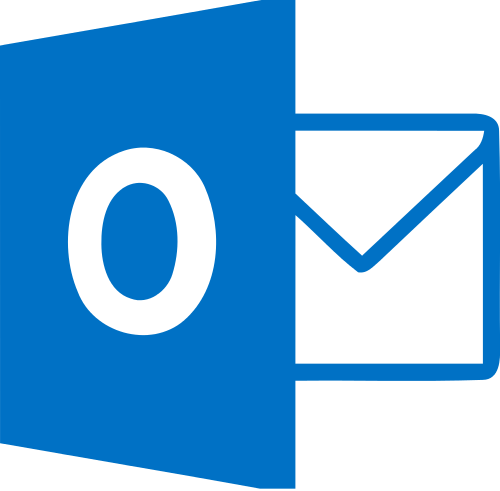 Open Microsoft Outlook and click the New Email button. 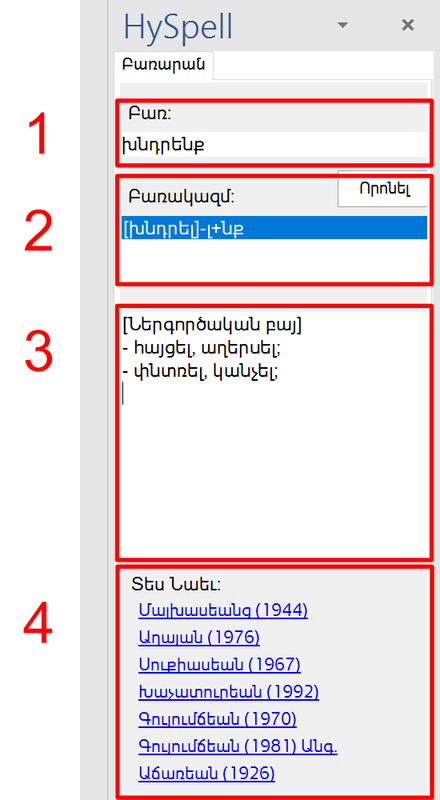 Select Options (Ընտրանք)… from the menu. 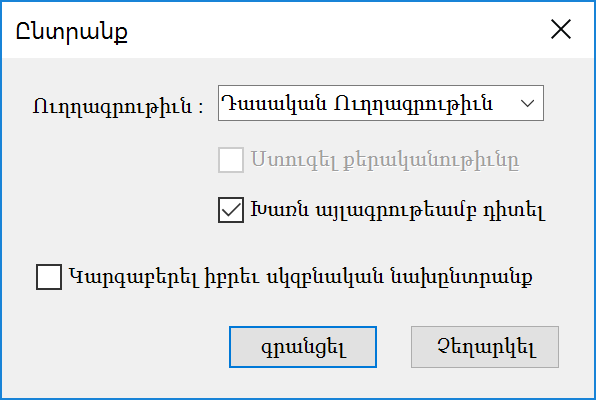 The Ընտրանք window displays the default settings when you start Microsoft Outlook. 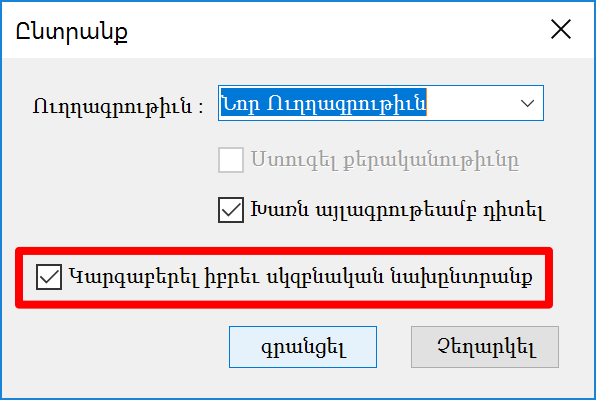 (It does not necessarily display the currently active settings.) 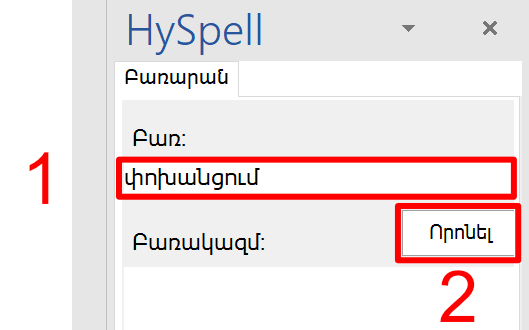 In the screenshot below, classical Armenian orthography is set as the default spelling the next time you start Microsoft Outlook, even though you may have set the spelling to reformed Armenian orthography during your current session. 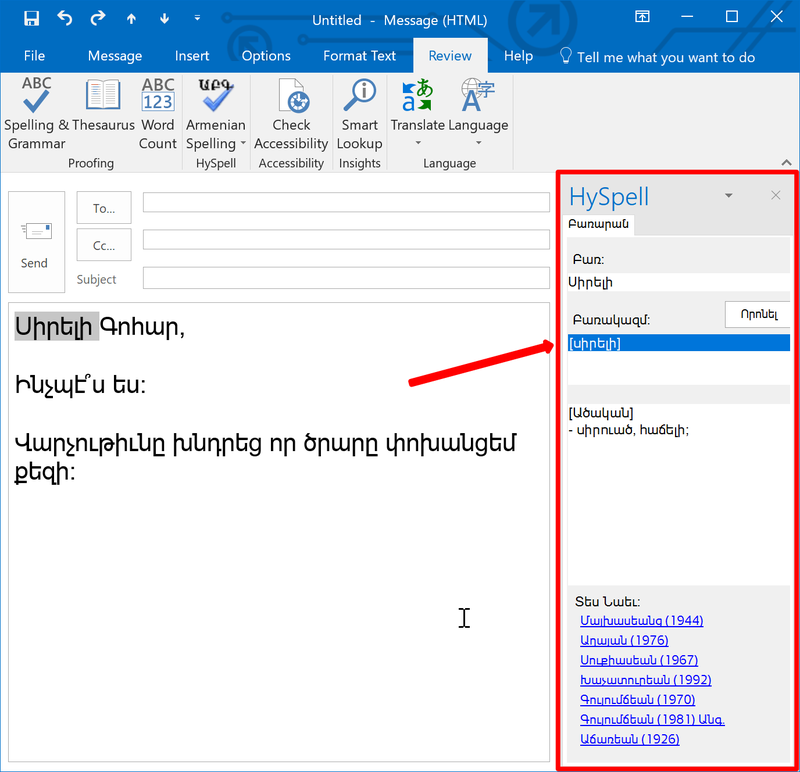 In this example, we’ll show you how to spellcheck an email message in Armenian. 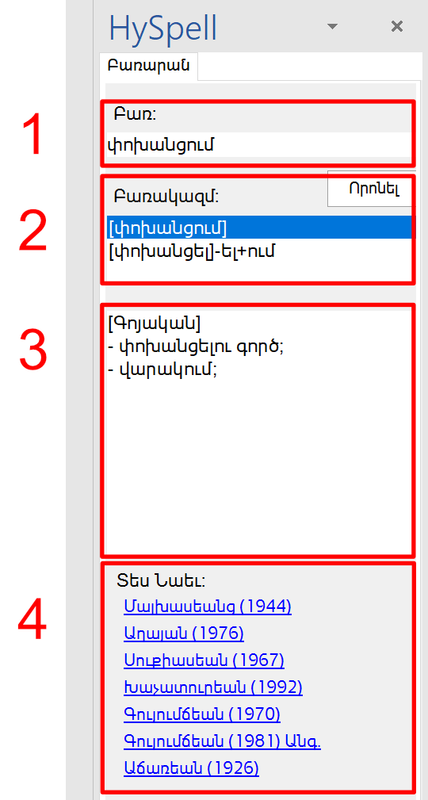 Compose your email in Armenian and then click on the Review tab. 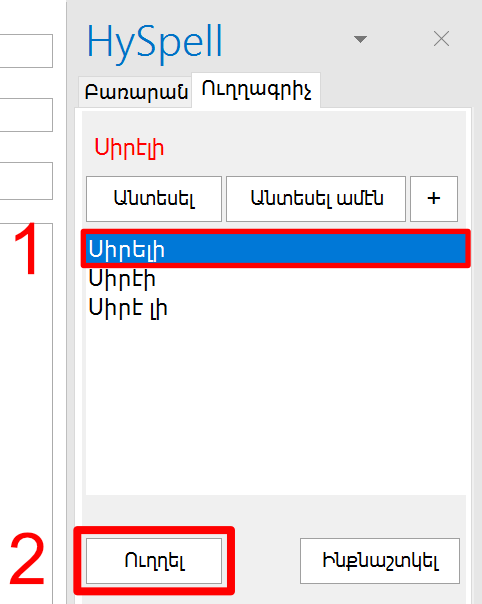 This may be useful, for example, if the word is an unrecognized name. 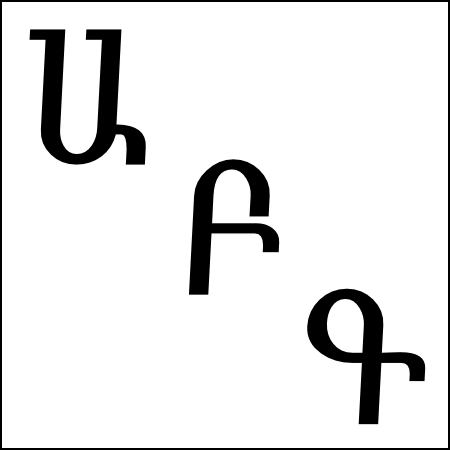 In the example below, Հայարփիին was not recognized. 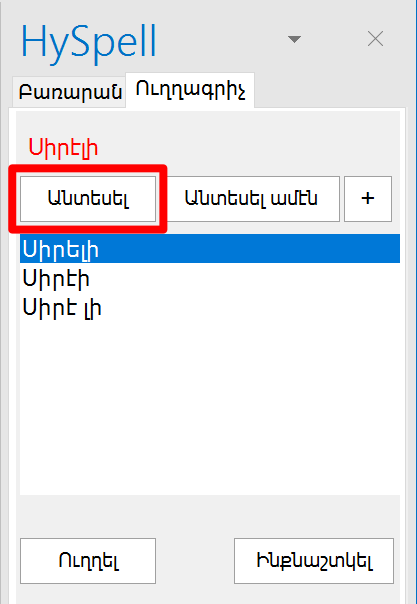 To add the name Հայարփի to the dictionary, click the + button. 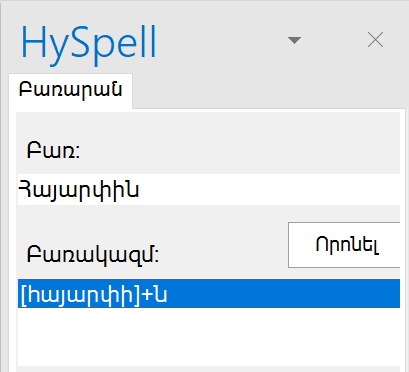 HySpell for Microsoft Outlook comes built-in with a stemmer and an Armenian dictionary-thesaurus («Բառգիրք հայերէն լեզուի» by Անդրանիկ վրդ. 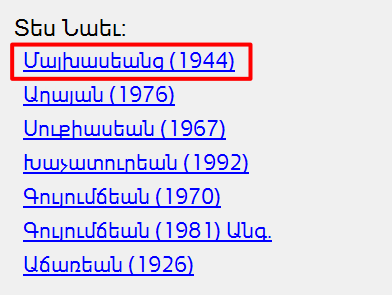 Կռանեան). 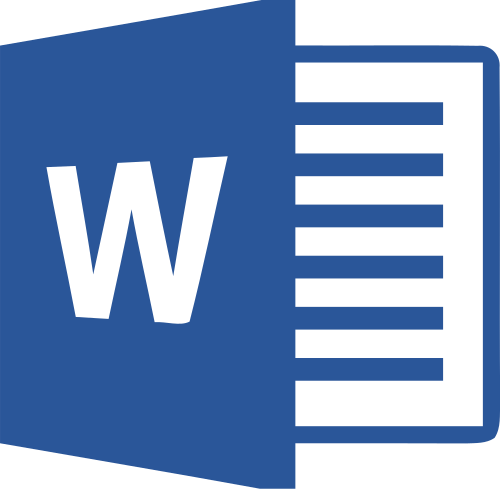 This can come in handy when you want to find a synonym of a word as you’re writing your email, or you want to double-check the meaning of a word. 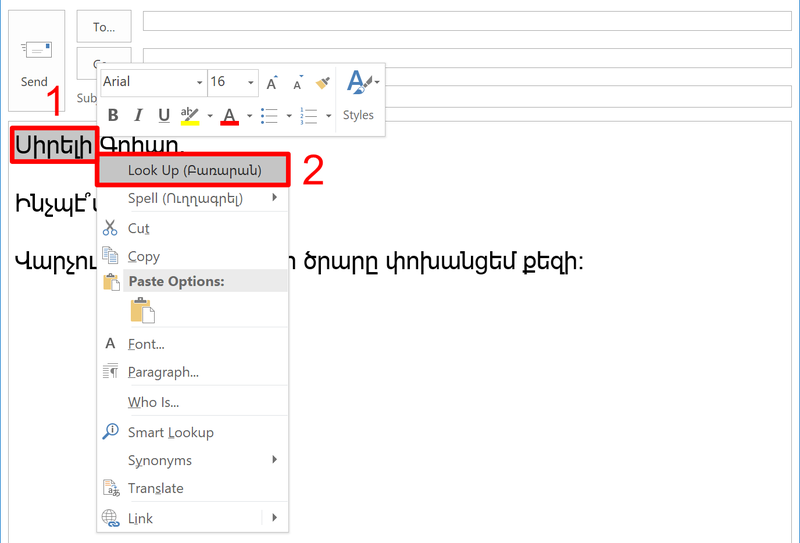 Highlight a word in the email, right-click, and select Look Up (Բառարան)… from the context menu.